Alias Grace is a fictional account of the true story of Grace Marks, a woman who was condemned to life imprisonment for murder in nineteenth-century Canada. Grace was only sixteen at the time of the crimes – she and her supposed accomplice, James McDermott, were accused of murdering the man they worked for, as well as his housekeeper. At the time of the autopsy, the housekeeper was discovered to be pregnant. Initially both Grace and McDermott were sentenced to hang, but Grace’s death sentence was commuted. Alias Grace opens some ten years after the crimes. A doctor by the name of Simon Jordan, who is investigating criminal behaviour, visits Grace in prison. She tells him her life story, from her early life in Ireland to her immigration and her years as a maid, first in a big house in Toronto and eventually on the farm house where the murders took place. The reader can often tell that Grace is not telling the whole story, but what exactly she’s holding only becomes clearer as the story moves on. Though never completely clear: Atwood also makes readers aware that Grace has fully entered the role of a storyteller – and her true story belongs to no one but herself. Alias Grace is also never quite clear on the question of whether Grace Marks was innocent or guilty, but her guilt or lack thereof isn’t really the point. In the afterword, Margaret Atwood says she found Grace Marks’ story fascinating because attitudes towards her reflected general attitudes towards women, and this really shows in Alias Grace. She’s thought of as either an evil murderess or an almost half-witted, helpless innocent. There’s no inbetween, and there’s barely anyone at all who’s willing to think of her as a real and complex human being. Alias Grace has some of the same suffocating quality of Sarah Waters’ Affinity, even if it’s about a completely different set of experiences. Unlike Margaret Prior, Grace is a poor woman, and she has to earn a living from a very young age. But what the two have in common is that they live in a world in which their gender severely limits the choices that are available to them. This isn’t true of only Grace, but also of several other characters in the story: her mother, her best friend Mary Whitney, Nancy Montgomery – the murdered housekeeper, and Mrs Humphrey, who is Dr Jordan’s landlady. There is a passage very near the end that helped me make up my mind about what I think happens in this book. I don’t want to spoil anything for those who haven’t read Alias Grace yet, so I won’t quote it. But it’s the passage in which Grace discusses forgiveness and the roles of victims and perpetrators. I found it very revealing of her feelings about both Nancy and Mary Whitney, and of the rage she felt about the situation these women found themselves in, as well as about the inevitability of their fate and the social structure that made it inevitable – a rage that she never quit admits, not even to herself. You know, I think Alias Grace may have surpassed The Handmaid’s Tale as my favourite Atwood. I’m barely scratching the surface here, but this is a beautiful, subtle, complex novel – everything, from the writing to the way it’s structured, is so beautifully done. The novel is divided into different sections, each named after different quilt patterns, and each preceded by quotes from Grace and McDermott’s testimonies, from other people’s accounts of the case, and from Victorian literature – Tennyson, Christina Rossetti, Emily Brontë, Emily Dickinson, Elizabeth Barrett Browning, and even that unforgettable classic, “The Angel in the House” (which is cleverly and very ironically placed). As for the writing, I am once again in awe of Margaret Atwood. I marked close to twenty passages to share, and it took me forever to select my favourite four. I’m still trying to understand why I loved this book more than any other Atwood I’ve read. There’s the beautiful writing, but that’s there all the time. in her books And there’s the historical setting – I have to admit that the word “Victorian” is always a selling point for me. But mostly I loved that she wrote a book that’s not only completely gripping and easy to read, but also very smart, perceptive and complex. And I love how it takes a good, serious look at gender, sexuality, social hypocrisy and double standards, the burden of having other people’s stories and definitions imposed on you, the concept of madness, and many other things, while still managing to be very funny at times. But along with stunning writing, if there’s one thing Margaret Atwood can always be relied on for it’s irony and dark humour. All the same, Murderess is a strong word to have attached to you. It has a smell to it, that word – musky and oppressive, like dead flowers in a vase. Sometimes at night I whisper it over to myself: Murderess, Murderess. It rustles, like a taffeta skirt across the floor. It was raining, and a huge crowd was standing in the mud, some of them come from miles away. If my own death sentence had not been commuted at the last minute, they would have watched me hang with the same greedy pleasure. There were many women and ladies there; everyone wanted to stare, they wanted to breathe death in like fine perfume, and when I read of it I thought, If this is a lesson to me, what is it I am supposed to be learning? Gone mad is what they say, and sometimes Run Mad, as if mad is a direction, like west; as if mad is a different house you could step into, or a separate country entirely. But when you go mad you don’t go any other place, you stay where you are. And somebody else comes in. While he writes, I feel as if he is drawing me; or not drawing me – drawing on my skin – not with the pencil he is using, but with an old-fashioned goose pen, and not with the quill end but with the feather end. As if hundreds of butterflies have settled all over my face, and are softly opening and closing their wings. But underneath that there is another feeling, a feeling of being wide-eyed awake and watchful. It’s like being wakened suddenly in the middle of the night, by a hand over your face, and you sit up with your heart going fast, and no one is there. And underneath that there is another feeling still, a feeling like being torn open; not like a body of flesh, it is not painful as such, but like a peach; and not even torn open, but too ripe and splitting open of its own accord. I have read every piece of prose fiction that Atwood has written, but I think Alias is one of those I need to re-read. I remember getting half way through it and kind of losing interest, but eventually picking it up again and finishing. I think I want to give it another go without a stop in the middle. I've only read The Handmaid's Tale, and I wasn't particularly impressed at the time. I didn't like the writing, even though I liked the story. A year later, the book's gone up in my estimation because I no longer remember all the writing pet peeves, just the story. I'm thinking I need to try something else by her, and I've been debating which one. I think I'm going to stick with speculative stuff, so maybe Oryx and Crake or The Blind Assassin, but I'm not sure. Wondrous! Must have! I am going to the library today to ditch all my library books and start reading books I own and haven't read (or own and have read really), but I may make a tiny exception and get this. I loved this book too, although it doesn't surpass my love for The Handmaid's Tale and I adored Surfacing... I simply adore Atwood, is all. I too saw the similarities with Affinity although I can't remember which I read first. A suffocating quality is a very apt description. I do love a Victorian-set book. This one sounds good to me! I'm not sure how I can classify myself as an avid reader or a book blogger when I have yet to read ONE Atwood. I'm hanging my head in shame. I blame my high school and colleges professors for my lack of knowledge of the classic writers. Anyway, one day I will redeem myself, and I might just start with this one! I haven't read an Atwood yet, either, but I hope to soon, since there's one in my TBR pile. You've made me want to read Alias Grace too! This is my favourite Atwood by far. You've just made me want to reread it! Glad you found it so satisfying. Oh my goodness, Alias Grace and The Blind Assassin are in close competition for my favorite all-time Atwood. I *loved* Alias Grace. I thought it was so smart and engaging and completely fascinating. We read it for my book club and everyone loved it (a rarity). So glad you read it! Have you read The Blind Assassin? I was so impressed by that book! I almost started reading this the other day, but a library book beckoned to me. I love this book. I love Atwood. And this post made me want to reread it right now. But not yet. Soon. Soon. In less than two months time hopefully. I love Atwood, but I'm not sure if I've read this or not. At first, just based on the title, I thought I had, but I'm doubting it. Either way, I guess I need to go pick it up. I love your "favorite passages." Great review! I've never read this! But, I'm a huge Margaret Atwood fan - my favs so far include Handmaid's Tale and Cat's Eye. Thanks for the thoughtful review - putting this on mt. tbr! I've been meaning to pick this up for years! I think I will soon! wow sounds amazing! I haven't read much Atwood. Sounds like it is time to. Lezlie: The more I read by her, the more impressed I am. I hope the same happens with you! Thomas: I hope you enjoy it more the second time around! Amanda: I haven't read Oryx and Crake yet, but I've heard nothing but good things. The Blind Assassin I have, though, and it was excellent. Jenny: This so deserved an exception! Claire: I need to get my hands on Surfacing! Fortunately my library has it, so my book buying ban won't get in the way. I remember that my Canadian Lit professor established some intriguing parallels between Surfacing and Monkey Beach by Eden Robinson (a book I adored). Andreea, it is! I hope you'll give it a try! Bermudaonion: I'm glad to hear it :D Is it Year of the Flood you're reading soon? Lucky! Melanie: I still have many Atwoods left to read, but I woudn't be surprised if this were to remain my favourite until the end. Daphne: I've read The Blind Assassin, yes. I loved it too! rhapsodyinbooks: She's an amazing writer! Sharry: I still haven't read Cat's Eye, but it's on the list. Rebecca: I might not be remembering correctly, but I think you weren't too crazy about The Handmaid's Tale, right? In any case I think you would enjoy this one! Nymeht, I didn't love Handmaid's tale, that's right. but I didn't hate it. There were just things that irked me. I have The Blind Assassin next on my bookshelf for this fall, and maybe Alias Grace will be next after that! I love this book. The first time I tried to read it, I quit halfway through, I just couldn't get into it. The second time around though, I couldn't put it down! I think of all the Atwood's I've read, this one has the most compelling story, but Ths Blind Assassin is still my fav! Wow -- what a beautiful review! I love A Handmaid's Tale, but haven't liked her other work as much. You have inspired me to read this one, though. I've never read Atwood, and will someday. Thank you for the great review and insights. I always enjoy your reviews! You pick up on the most interesting things. I'm glad that I have Alias Grace on my bookshelves. I now I am in no danger of reading it soon, but after your review maybe I will get to read it by the end of the year. Earlier this year I read Lady Audley's Secret and similarly it discussed women's roles in murder and the treatment of women as child like or just completely evil with no real in between. This is such an irresistible review! now I have to read this, if it's even better than the Handmaid's tale! I love this too but I have to admit part of the reason is I love Victorian true crime. I also have my mind made up about whether she is guilty or innocent but then it's been a while since I read it so my reasoning has left me. I'd say this is my favourite Atwood read to date but I did read The Handmaid's Tale as a young teenager so a re-read is needed to really count that in my selections. I probably fail some kind of Canadian Reader Test, because I am not crazy about Atwood. I have read The Penelopiad, Oryx and Crake, and a book of her short stories (thanks, highschool, for that one). Maybe I need to try more of the novels she is known for. This description of Alias Grace certainly makes it sound quite good. As for Oryx and Crake, I think it suffered from "I had a great concept, but now don't know how to make this end..." There is one element of the story that is being kept a mystery for most of the novel, and that is very effective, but then the mystery (i.e. how the world ended) is revealed, and it falls short, and the novel collapses. She would have been better off never actually saying what happened. Rebecca: I hope you enjoy The Blind Assassin! It's an unusual book, but I really loved it. Lahni: You're not the first to say they had trouble getting into it at first! For some reason I was sucked in right away - it probably helps that I've been in the mood for Victorian. Maree: Can't go wrong with Atwood or dystopian, let alone the two combined! Jenny, you're welcome :) I hope you enjoy her work when you get to it. ds: I love it too. She pulls it off like no one else. Nicole: Thank you so much! I hadn't heard of Lady Audley's Secret, but now I want to add it to my list. Valentina: I might be in the minority in liking this one best, but in any case I think you'll enjoy it. Nicola: Thanks for the link! I have a theory about Grace too, but I kind of like how she doesn't let us be completely sure. BookSnob: You don't! I can see why she's not for everyone. I'm always disappointed when a book's big reveal at the end turns out not to be as big a deal as the whole book hinted it would be. I have this and Oryx & Crake in house - mooched right after I read The Handmaid's Tale. I love that her themes are all so different. I'm probably the only person who has read very little of Atwood. I want to read this book! Great post. Oh my...surpassed The Handmaid's Tale? Guess I should probably pick this up then. I loved Handmaid's Tale. As always, this is a wonderful review! Ok, it's like you're peering into my reading lists and reading them all before me! :P This is my book club pick for October and I swear October can't get here soon enough (um, read-a-thon, too!!). This really caught my eye: "You know, I think Alias Grace may have surpassed The Handmaid’s Tale as my favourite Atwood" YIPPEE!! Really liking Twilights of Avalon, by the way! 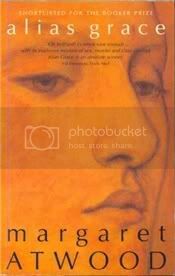 Alias Grace is not among my favorite Atwood novels, although that is just to say that I think many of the others are better, not that there's anything wrong with that one. Oryx and Crake is one of my favorites, and you all need to hurry up and read it before The Year of the Flood comes out in September!!! This sounds like another good read so I'll have to look out for this as well! I'm really glad you enjoyed this. I can't decide which is my favourite. I really liked The Robber Bride and Blind Assassin as well as this and Oryx and Crake plus The Handmaids Tale. Argh too many to choose from!!! I hope you continue to enjoy her books. I've only read a couple of Atwood's books, and this was not one of them. It sounds like a really gripping story, and I have always liked Atwood's style, so I should probably pick this one up. Great review! I will let you know what I think of it. It's been so many years since I first read this, I really should read it again sometime. Another one for the re-read list. I've only read 5, I think, of her books but this one probably is my favourite up there with The Handmaid's Tale. This is one of my all time favorite books! Care: I think that most of all I love that she approaches similar themes from such completely different angles! Diane, I'm sure you're not alone! Stephanie: Well, for me :P I'm sure not everyone will like it better. Trish: lol! I really hope you enjoy it as much as I did. And yay for October! Jena: Oh, what great finds! Jeanne: Yes, I definitely need to read it. I've been hearing nothing but good things about both it and Year of the Blood. Melody, no reason to be ashamed! Rhinoa: Yes, too many to choose from! She's just so good. Kim: Yep! This would be the perfect cure for sure. Wow, liking it more than Handmaid's Tale is a high compliment! I've never been intrigued by this one before, but I'll keep it on my to-read shelf & give it a go. I bought this at a library sale a while back, but it's been sitting on the shelf. I'm intrigued by the fact that you think it might be better than The Handmaid's Tale, which I loved. I'm going to have to dig out my copy and find out for myself. Great review!